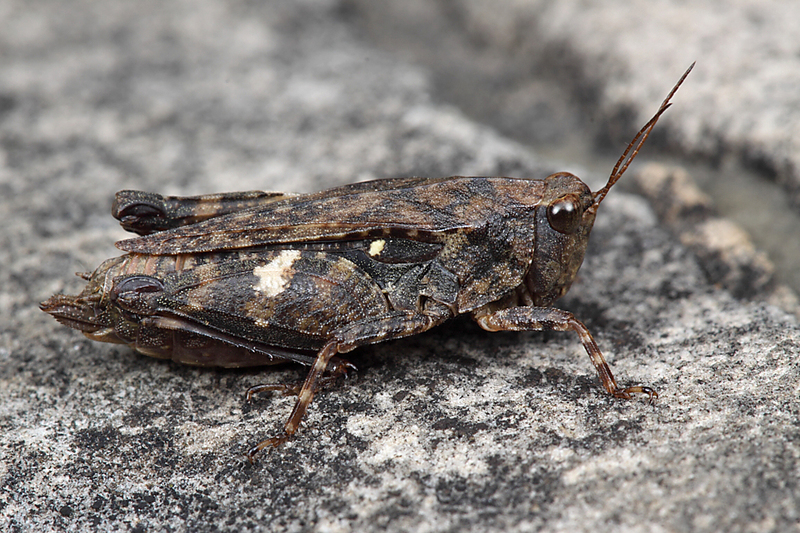 Not long ago, I got an email from grasshopper expert David J. Ferguson confirming my identification of Pardalophora phoenicoptera (and also encouraging my recent fascination with band-winged grasshoppers (family Acrididae, subfamily Oedepodinae) and their marvelously cryptic nymphs). He suggested that I might also find the “toad lubbers” (family Romaleidae) and pygmy grasshoppers (family Tetrigidae) interesting, since they too have many of those qualities I was finding attractive in band-winged nymphs, only on a very small scale. It was a prescient comment, as I’d already started taking notice of the pygmies and even photographed one before ever getting his email. Tettigidea lateralis | Shaw Nature Reserve, Missouri. I take this individual to represent Tettigidea lateralis (black-sided pygmy grasshopper), which I saw at Shaw Nature Reserve during my May search for Cylindera unipunctata. Actually, I’m not sure I would have even noticed this individual, as I walked along the trail going from open woodland through dry dolomite glade, had it not actually been sitting on my net rim. I haven’t studied pygmies all that much, other than to note that they seem common around streams and other wet areas and are usually quite small. This one, however, at close to 15mm in length seemed positively gigantic! I placed it on the barren dolomite along the trail, expecting it to flee immediately. Instead it just sat there—begging me to photograph it, so I did. Bold, white femoral markings contrast nicely with its otherwise marvelously cryptic coloration. This one appears to be a female with a short pronotum, but I can’t tell if it is an adult with short wings or still a nymph (it was certainly large enough to be an adult!). Either way, I’m interested in the function of the bright white femoral marking on what is otherwise a very cryptically colored individual. 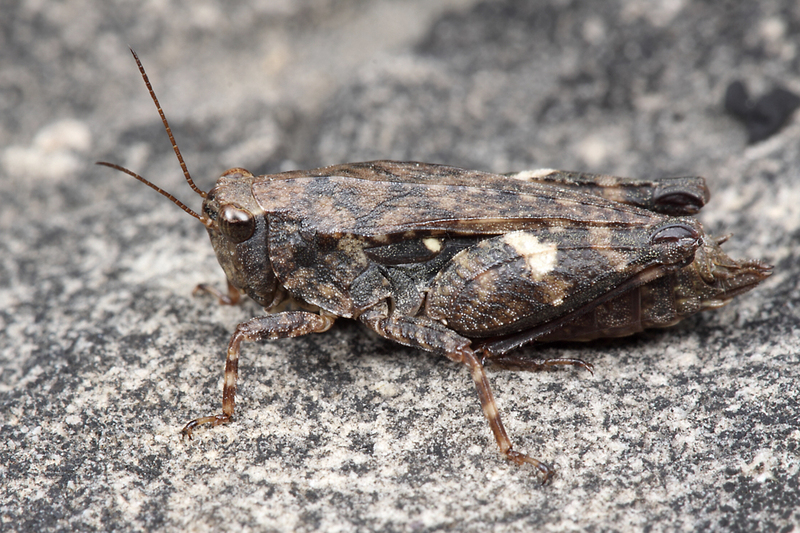 This entry was posted in Orthoptera, Tetrigidae and tagged crypsis, entomology, grasshoppers, insects, Missouri, nature, pygmy grasshoppers, science. Bookmark the permalink. Very nice, Ted. Plus an identification! I’m planning to go out to Kickapoo State Park to photograph later this morning. It’s the location where I had opportunity to photograph an unexpected association between snails and tetrigids (http://thingsbiological.wordpress.com/2010/05/22/phoretic-snails/). Maybe I’ll see it again this year… Happy fourth! I remember that post – I’ll be interested to know if you see the same thing again. It could be how the snails move between temporary pools. Too bad – I was hoping our ‘phoresy’ hypothesis would hold up. I’m guessing the white band is disruptive of the hopper’s outline. Looking at BugGuide images, I see that some others in that family have a band like that, such as Tettigidea armata and Tetrix ornata. Tetrix arenosa has a variable white blotch on the pronotum. This is a neat group; I hope your expertise can help us amateurs! I think you’re probably right. The interesting thing is that this is a highly variable species, with all manner of light forms, dark forms, mottled forms, bi-colored forms, etc. Fuel for evolution! Thanks, BB. Perhaps the hopper felt safe against the warm, mottled dolomite. Another micro-animal rescuer – I love it! Hi Ted, great pic, I printed this one out so my 8 year old could see the craziness of mother nature.